Published: Wed, November 13, 2013 @ 12:00 a.m. Hours: Monday, 11:30 a.m. to 9 p.m.; Tuesday through Thursday, 11:30 a.m. to 11 p.m.; Friday and Saturday, 11:30 a.m. to 1 a.m.; and Sunday, 11:30 a.m. to 9 p.m. Menu: Eight burgers plus a Burger of the Month ($8.49 to $9.99). Out of the construction rises ... a burger. Brick by brick and stone by stone, and then burger by burger. First it was the building, now called the StoneYard Grill & Tavern. Then, after tweaking the burgers a couple of times, a delicious burger menu was built. The building was originally Kuzmaul’s Pharmacy, a long-standing fixture in downtown Niles. StoneYard owner Brent Ross did a great remodel of the building, and he hopes to entice people in with their own culinary delights. The StoneYard is a full service restaurant-bar catering to the people of Niles, as well as anyone passing through who visits the birth home, library and museum of the 25th president, William McKinley. We skipped the history lesson this time and headed straight for the burgers. Upon entering the eatery, we found a nice table in the restaurant section, where we could survey all the food being served and watch the game on the big screens. There also is a bar area and outdoor covered patio if you want a more laid-back feel to your meal. The menu had six delicious-sounding half-pound choices: Caprese (grilled tomato, mozzarella, basil, balsamic glaze, on a garlic ciabatta roll), Carnivore (quarter-pound beef topped with American cheese, quarter pound of sausage topped with provolone cheese, bacon, onion straws, lettuce and tomato), Cowboy (hand dipped beer-battered onion rings, bacon, cheddar cheese, barbecue sauce), Backyard Barbecue (StoneYard barbecue pulled pork, grilled onions, cheddar cheese and potato chips drizzled with BBQ sauce), Stadium (pepper jack cheese, hot dog, cheddar jack cheese, diced onions, sliced pickle and stadium mustard, on a pretzel bun), and Italian (Italian greens, roasted red peppers, fresh mozzarella, marinara sauce, Romano cheese, on thick-cut Italian bread). Also available is the Build Your Own. It can be half-pound for $8.49 or quarter-pound for $6.99 on a toasted roll and topped any way you want; toppings are available for an extra charge. The burgers are served on a toasted roll, but you can substitute a ciabatta roll, Italian bread or a pretzel bun, each topped with lettuce, tomato and onion. You also get a pickle spear and hand-cut fries. If you are really hungry, you can make your burger a full pound for $4 more. Brent said they have been working on the burger menu since the restaurant opened, trying many different burgers to find which menu combination worked the best. In fact, he added that two of the Burgers of the Month have made it to the regular menu — the Italian and the Stadium. We were happy with the burgers offered and thought each was seasoned well, and accompanied by some very fresh toppings, which always makes your burger that much better. I had the Italian, substituting a garlic ciabatta roll, and enjoyed the blend of greens and roasted peppers, especially as each bite also brought a good-sized chunk of mozzarella cheese. The perfectly cooked medium burger left enough juices in the soft ciabatta roll that I savored each bite’s amazing flavor. It seemed like it was gone too fast, but it filled me up. I also had sweet potato fries that were very good. 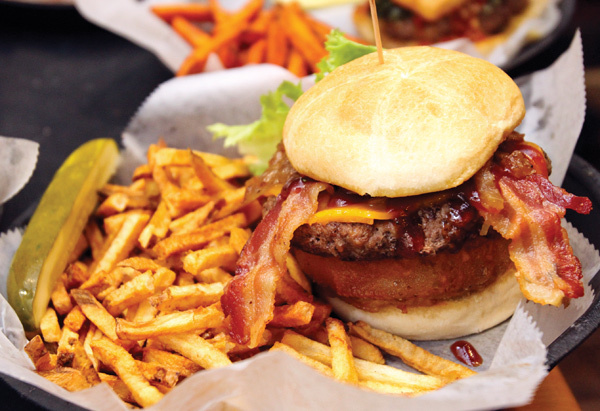 The StoneYard Grill has built a great menu, and the burgers are definitely worth adding to your “try me” list. Check their Web page to find all the specials and events, and keep tabs on each new Burger of the Month. The StoneYard, across the street from William McKinley’s birthplace, offers a great resting place to get a tasty burger after you’ve had the presidential tour.